Why is the Kindle sold in Zimbabwe, East Timor but not New Zealand? Posted byLance Wiggs	 January 27, 2010 January 26, 2010 16 Comments on Why is the Kindle sold in Zimbabwe, East Timor but not New Zealand? I’ve written before about Apple’s poor attention to international people – those that travel and live in multiple countries. It’s one of the reasons that I am trying not to get too excited about the forthcoming tablet. The tablet appears to be aiming at bringing media to your knees – meaning books, movies and games – along with music of course. If it is a typical Apple product, then they will finally make this whole thing work, and I’ll fail in quenching my desire to have one. I do wonder though whether we’ll even be able to buy one. The first iPhone was restricted to the USA, and let’s look at a recent and very frustrating example – The Kindle. I own a US Kindle – unable to receive wireless support anywhere but there, but it is an absolutely astonishing device that I heartily recommend to anyone that asks – and plenty have. The story of how I got it is worth telling. I arranged for the Kindle to be shipped to me from Amazon while I was in San Francisco, late last year, just before attending @timoreilly’s foo camp a couple of hours North in Sebastopol. @nzkoz and I were privileged to be invited, thanks to the efforts of @gnat. Thanks Nat. Somehow we did get to foo safely. 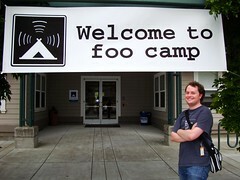 foo camp was great – a lot bigger in feel to the Kiwi-foo, or baacamp version, although a lot less alcohol was consumed. We were quietly drinking with a few new-found friends that night, when I pulled out the Kindle. It was beautiful. Gorgeous edges, a lovely screen – and yet – it didn’t work. To make it work my Amazon account needed to be associated with a US credit card – as US accounts only could buy books. It was frustrating – such a wonderful device was lead in my hands and it was useless. Now I may have vented a little about this and other sorts of situations, and there may or may not have been an Amazon person nearby, and maybe they de-prioritized New Zealand. I digress. It was beautiful to use – the books were easy to find and downloaded almost instantly. I was fulsome in my praise – the kid with a new toy, and excited that my time offline in Mozambique would now be rendered sane. The larger, DX, version of the Kindle that I had was relatively new, and so several people were very interested in checking it out – so it did the rounds a little, and then ended up on the table in front of someone. And then it happened – in slow motion. A full water bottle was accidentally upended and a Kindle DX-sized wave of water swept across the top of the Kindle. It was beautiful. It was terrifying. But most of all it was as funny as hell, and I joined in with the laughter. Perversely the spiller had not been drinking – well only water. But then he was Jesse Robbins, the “master of disaster” who used to go around pulling plugs out of servers – and server rooms – while working for Amazon. (It’s the only way they could really test disaster preparedness). So while Jesse had moved on to Opscode, his Amazon destruction skills were still very much intact. But unlike the data centers that survived Jesse’s attacks, sadly it seems that Kindles are not immune to the hazards of water. While the device was mostly ok, two of the buttons were sporadically firing, and the cursor was moving down the screen until interrupted by a series of v’s were entered in the comments. Not to worry – this was Friday night, and there were two full days for it to dry out before I went to Mozambique. It didn’t. And while Jesse had immediately, and continuously through the weekend, very graciously offered to replace the Kindle, the issue was not one of money, but one of whether I could get a Kindle in my hands before the Sunday evening flight to Africa. By the the last hour of the weekend at foo I was resigned (although somewhat looking forward) to taking the Kindle to pieces in Mozambique to see whether some further drying would work. and then a miracle. Jesse walked into the room with another Kindle DX, complete with cover, and handed it to me. He’d got it from one of his investors, who was partially (at least) responsible for the development of the Kindle in the first place. We did a straight swap and my time in Mozambique was saved. Good people these Americans. Very good people. So, if you’d excuse the long story, it was quite a journey to get my hands on a working Kindle. 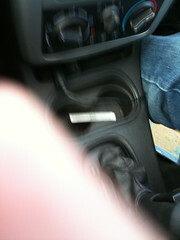 I have to repeat though, that the Kindle itself revolutionized travel for me. I’ve motorcycled and flown to too many places and carted around far too many heavy books while I have done so. The eternal search for the latest Economist, or anything decent in English, is now over. All I need is a Kindle and occasional access to the internet. I buy lots of books, download them books to my computer and then transfer them via USB to the Kindle. The Kindle was restricted to America, but soon after it became available world-wide. Isn’t that great? 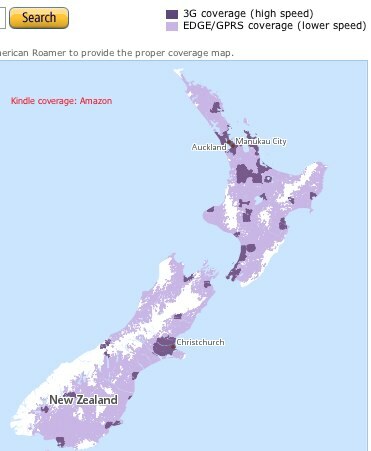 The Kindle and its bigger brethren the Kindle DX are now in GSM versions, and you can use it as intended – to wirelessly receive books, magazines and newspapers all over the place – even in New Zealand, with a map that is suspiciously like the Vodafone coverage map. My one is a CDMA USA version, so I can only look at this map and grimace. That’s interesting – what about the Samoa we are more familiar with? to the vast steppes of Russia – there are plenty in Asia and Europe that can buy the Kindle. But who would have expected Rwanda? But the real kicker – is that you can buy the Kindle in Zimbabwe. But yes, as you know or have guessed, the Kindle is not available to us in New Zealand – perceived as the least corrupt place in the world, and measured as the 2nd easiest to do business. That’s very difficult for us to understand. Very difficult. So why – why is the Kindle not sold here? Does anyone know? Enrolling in Budget’s Fastbreak is Easy! 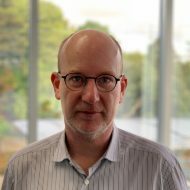 The only rumours that have gone around have been that Amazon was having trouble coming to an agreement with a 3G carrier – there was a bit of kerfufflay in Oct 09 that they were in talks with Vodafone, though Telecom then was also supposedly making a play, and we were going to see it all going ahead in the new year. Since then, silence. The reasons and (one can only presume) problems have all been played incredibly close to the chest. My completely uninformed guess is that it’s the publishers and authors. All those other countries aren’t likely to have their own region-specific distribution rights. We, on the other hand, are big enough to justify publishers and authors negotiating specifically with a local outfit. However, we’re *not* big enough for amazon to justify negotiating with those same outfits. Net result, no kindle. Again, I’m just guessing, but given how long it took to get the iTunes music store, I’m pretty sure it’s a reasonable guess. Not sure it’s to do with publishers/distribution rights as I think you can buy books using the Kindle PC application in New Zealand. Can anyone confirm? My completely uninformed guess is the same as you, but to do with cellphone providers. Countries without 3G networks just don’t get any wireless coverages, so they’re easy to sell to. Amazon’s got a big incentive to negotiate with large countries with 3G networks, so they can sell to that market. And NZ is right in the middle – Not small enough to have no network, but not big enough for Amazon to devote much time to negotiations. (And roaming doesn’t count – that’s a paid service that’s presumably through an agreement between the home country provider and the foreign provider, nothing to do with Amazon). You can use a Kindle here on the Vodafone network BookieMonster – you just can’t ship one to NZ or use one with a NZ account. It’s nothing to do with not having a deal with a NZ carrier. If you’re an Australian customer for example you can bring your Kindle on holiday with you and use it for downloading content via Vodafone. The most frustrating thing is knowing why we can’t buy one directly in NZ – and nobody has a good explanation! Is that official (using it on Vodafone)? Yes. Lance posted the Kindle coverage map – this is what is shown on the Kindle site when you look at the global coverage map. Kindle’s have been able to roam here, this is a completely different issue to not being able to buy one here. Funny, that. Especially since East Timor has no (functioning) 3G network; that rules out negotiations with carriers, doesn’t it? it’s even more perverse now. You can buy a 6″ 3g kindle and ship to New Zealand, just not a DX. i’d love to know why…. Now i found amazon available kindle to ship in new zealand in 3 form – kindle3,kindle 3g and new kindle when will kindle touch and Dx will be available?